I recently joined two colleagues, both STEM Ambassadors, to deliver a British Science Week activity at a local primary school. Over the course of the day, we told the whole school about the work of the Predatory Bird Monitoring Scheme; a programme that gathers evidence of contaminant uptake by avian raptors across the UK. We did this by using a “touch table” with bird wings and bones, a microscope demonstration of the flesh eating beetles used to clean off these bones (! ), and a food web puzzle activity. Throughout the day we tailored our messages to the age-groups we were working with. This is not the first school activity I have been a part of, for example see an earlier blog post about my effort to create a lake in a tank. Over the last few years I’ve introduced children to satellite observation, lake physics, the passage of the seasons and the mysterious world of freshwater plankton! Being involved in British Science Week again reminded me how rewarding public engagement can be, especially in a school setting. Children ask great questions, share stories and their own knowledge of nature, and, above all, help sustain my own passion for research. These interactions bring to the fore my own child-like curiosity and desire to learn. "Children ask great questions, share stories and their own knowledge of nature, and, above all, help sustain my own passion for research. These interactions bring to the fore my own child-like curiosity and desire to learn." 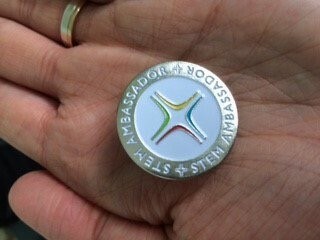 After this most recent school visit, I decided to "make it official" and become a STEM Ambassador myself. I now have the rather wonderful badge to prove it (pictured right)! I feel very proud to have joined such a great network. As one of my first activities I have started to create some primary school activity sheets that can be used alongside pond dipping in schools. This is something I have been involved in, and perhaps some of you have too. I have included copies of these here and on my web page for download and use by STEM Ambassadors, other scientists working with schools, and teachers. I have made just a few for now, but plan to develop more. Please use them, if you wish. I hope they are useful, and feedback is definitely welcome. Just email me!